Is a top-notch weekend getaway accompanied by your favorite furry friend, and filled with adventure AND all the finer things really possible? The answer is yes–and we’re about to tell you how. A two-hour drive from Atlanta, under two from Asheville, and four hours from Birmingham is the stunning town of Highlands, North Carolina. It’s drivable from many of the places we call ‘home’ in the southeast. Close enough for a weekend getaway or just a few nights of replenishment, even the drive–filled with mountain views and windy roads–feels like a vacation in itself. It’s impossible not to feel immediately swept away as you cruise up the mountain and make a right turn on Main Street, entering this picturesque town. Only seconds after you take that infamous right turn, you’ll arrive at The Park on Main, a luxury, pet-friendly hotel sitting perfectly among lush landscaping on the corner of Main and 2nd. Now, we already know what you’re thinking–“Luxury and pet friendly? Can those really go together?” And, the answer is a resounding yes. In this case at least! First of all, if you’re a tried and true dog lover, we’re right there with you. Second, we’re certain that, like us, you’ve found yourself at some point frustrated that your pup had to stay behind while you vacationed. In a day and age filled with dog friendly restaurant patios and even retailers who welcome these important members of our families to shop with us, leaving them behind on some of our greatest recreational adventures is nothing short of disappointing. At the same time, however, pet-friendly vacation rentals and hotels don’t necessarily have the best reputation, #amiright!? So when we contemplate where to spend our hard earned money, its natural that we often land on higher end experiences that, unfortunately, include booking our favorite pet-sitter or kennel as well. The Park on Main will transform everything you ever assumed about what a pet-friendly hotel could be. Truly luxurious, the lobby you’ll find upon entering the giant, wooden front doors is filled with crystal chandeliers and lounge furniture ideal for sinking into with a book. Our favorite part–the walls are tastefully covered in large, framed paintings of prestigious looking pups. These paintings can also be found amongst the 24 guest suites on site, and there are 54 breeds represented in these masterpieces. Guests love looking for their beloved breed! Okay, so the lobby is nice, but what about the rooms? Can it be true? Trust us, we completely understand the doubt that surrounds this whole thing. But from the moment you step into your luxe guest room, here’s what you’ll see: (most importantly) crisp, white linens tucked into a cloud-like mattress, topped with the most perfect pillows. There are clean, plush rugs lying under tastefully selected furniture. They have comfortable chairs, a flat screen HD television, and even a fireplace in select rooms–and we can’t forget the bathroom. Oh, the bathroom. Complete with heated floors, thick, cozy towels and robes, a sleek glass-door shower with multiple shower heads, and the most dreamy claw foot bathtub you may have ever seen. The vanity is nothing short of beautiful, and stocked with custom all natural soaps created especially for The Park on Main. Even your pups will have royal treatment – each guest Suite is stocked with an Orvis dog bed and Mackenzie-Childs dog bowl. 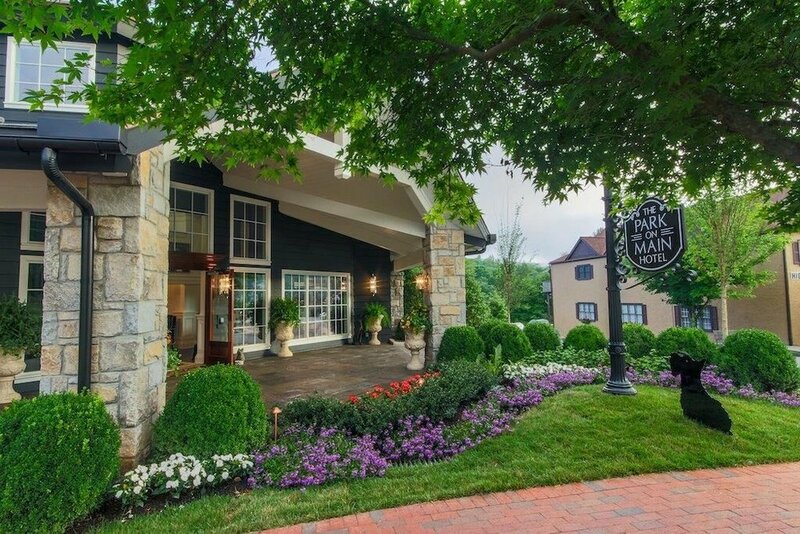 Topped off with a complimentary breakfast and excellent guest service, a weekend stay at The Park on Main will put all of your hesitations to rest about what a pet-friendly resort can be! Now, if you’ve ever visited Highlands, NC, then you know that the availability of activities is nearly endless. No matter the season, there’s hiking, rafting, zip-lining, fireside sitting, shopping, waterfall-chasing, kayaking…the list goes on! Regardless of how you choose to spend your time in this little town, all of the activities have one thing in common – they’ll leave you with a big appetite! So, when the sun begins to settle and hunger arises, we suggest you leave your furry friend(s) for a nap and take a stroll down Main Street to Wolfgang’s Restaurant & Wine Bistro. 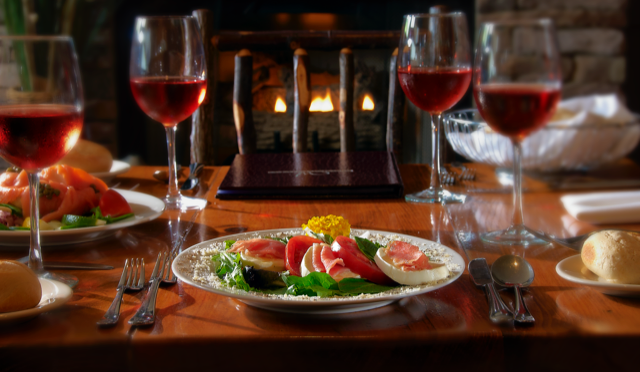 While there are many great dining options in Highlands, Wolfgang’s Restaurant & Wine Bistro is infamous–a favorite of residents and visitors, alike–and a great choice for cuisine throughout your weekend getaway! For 23 years, German-born Chef Wolfgang Green and his family have owned and operated this fine dining town staple. Wolfgang’s has received numerous awards and recognitions throughout the years, and as any Highlands resident or regular will tell you–it’s a must while you’re in town! From pecan-crusted shrimp to hand breaded fried brie as a starter, to fresh local mountain trout or a Bavarian platter (complete with Bratwurst, knockwurst, kassler, and a schnitzel) as a main course, you’ll notice bits and pieces of Chef’s heritage and his travels incorporated into the different menu items. Being able to not only master, but combine different cultures so well is just one of the many reasons why you’ll definitely need to make a reservation far in advance for dinner in the Wolfgang’s dining room on any given evening. Whether you choose the intimate, candle-lit dining room or the slightly more casual bistro at Wolfgang’s Restaurant, be sure to ask for Annelize. The restaurant’s Sommelier, Annelize is not only incredibly knowledgeable about the extensive wine list, but she is wonderfully down to earth and determined to ensure that every guest is blown away by the pairing of wine with their meal or simply by experiencing wine in a whole new light. An order of Chef Wolfgang’s family recipe apple strudel and a conversation with Annelize will indeed top off your evening in perfect fashion. Evening 1: Dress up for a fancy dinner in the dining room. Order the trout! Evening 2: Arrive to Wolfgang’s early to enjoy small bites, drinks, and dessert in the Bistro, then end the evening with a walk or drive up to sunset rock where, you guessed it, you’ll witness the most epic sunset ever! So simple, but so wonderful – we’re confident that your luxury adventure to the mountains with your furry sidekicks will not disappoint. Taking our advice? Be sure to let us know by tagging @goodgritmag, @theparkonmain, and @wolfgangsrestaurant on social media!